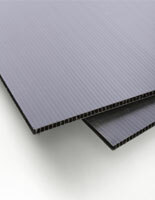 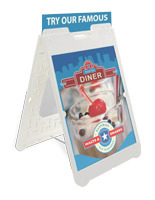 Are you in the market for outdoor sidewalk signs with a-frame design and plastic construction? 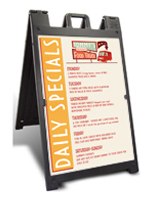 We carry a full line of exterior-rated, waterproof and weatherproof polyethylene and polystyrene sandwich board systems for all your advertising needs. 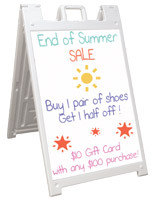 Our exterior-rated sidewalk signs are made with several different options for displaying text and graphics. 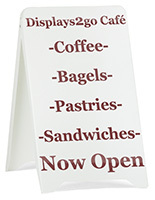 The plastic message stands are a great way to attract new customers, promote sales and provide information to people who may be passing by your storefront for the first time. 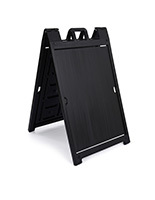 Choose black and white plastic a-frame folding signs that are affordable, and will stand the test of time. 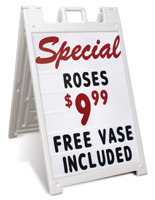 Make the most of the walkway and street in front of your business by calling attention inside via these a-frames. The outdoor sidewalk signs, also known as a signage sign board, are rust resistant, due to the polyethylene and polystyrene construction. 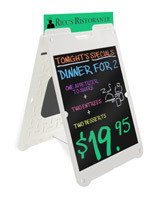 The biggest perk of this plastic a-frame is the fact that they can be changed or updated quickly without having to be replaced. 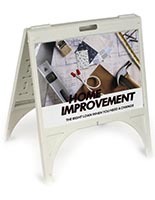 These outdoor sidewalk signs are extremely durable and economical, with features like fillable holes for sand, to anchor them; and handles for easy carrying. 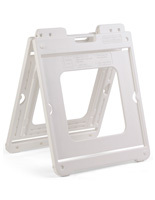 The folding design makes transport and storage effortless, too. 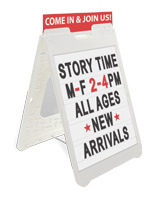 Updating messaging is easy, as well; buy plastic sandwich boards with Coroplast® inserts for signage, or buy folding signage with surfaces compatible with wet- or dry-erase markers. 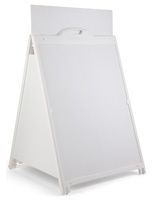 Where can these weather resistant plastic sandwich boards be used? 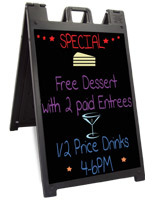 The outdoor sidewalk signs are designed for use in front of stores, restaurants, bars, clubs or businesses. 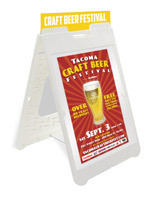 Choose from several display options to make the most of your location and foot traffic. 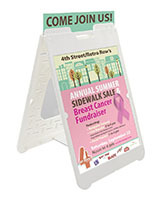 Plastic a-frame sign boards are great for outdoor events like concerts, fairs and community gatherings. 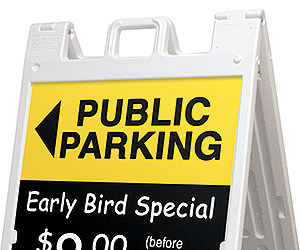 Designate parking, time slots for shows or other information on tickets. 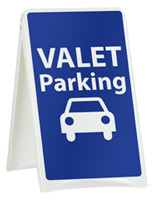 Even though a weatherproof sign holder is meant for use out of doors (event parking lots, for example), they can be placed inside any shop or business establishment. 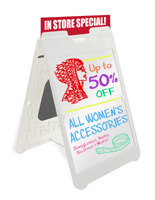 Use the space to provide information on sales, promotions or store hours. 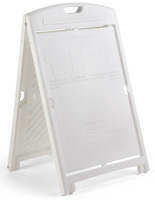 Use waterproof plastic a-frame signage at schools or universities to designate certain buildings for campus tours or provide students with information about upcoming events and activities. 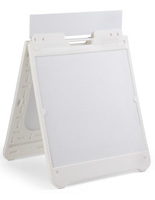 Another benefit of parking a weatherproof sandwich board at an event occurring out of doors, or outside of a cafe or store, is that these plastic folding signs are fully portable. 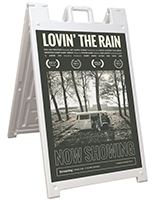 Because plastic a-frame signage can be opened and closed easily, you can store them in small spaces or load them into a car or van to bring to various locations. 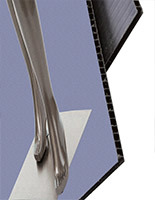 Most of these models have handles, and many have wheels. 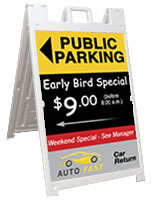 The economical design allows you to use the signs for years without fear of them rusting, bending, splintering, or breaking. 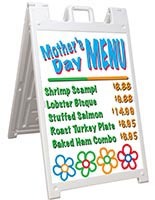 In addition, having the option to quickly change the folding sidewalk sign saves you money as it can be customized for any occasion or location and easily updated when those details change. 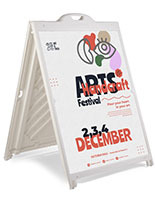 To stabilize a plastic a-frame sign, some models have fill holes, which is a great feature when advertising at a busy festival or concert, or when weather conditions aren’t optimal (wind won’t knock them over when they are filled with sand!). 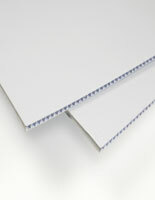 Make the most of your available space and save on time, money, and hassle. 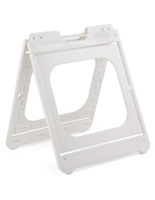 These polystyrene and polyethylene display stands come in white or black frames to complement event décor and store themes. 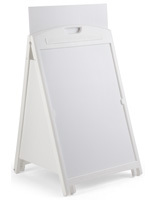 Folding advertising signs are sold with Coroplast™ inserts, custom vinyl adhesive lettering, or wet- or dry-erase surfaces in black or white. 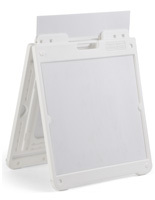 Enjoy the lightweight quality of these portable message boards for transporting and storage. 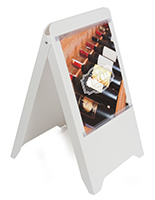 Look for additional features such as handles, wheels, headers, and stay tabs to secure the poster inside the fixture. 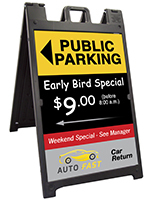 Select economically priced signage that perfectly reflects the needs of your retail showroom, restaurant, or outside event and boost traffic without a whole lot of effort.